Can you tell that I’m into zombies? Today’s featured title is George A. Romero’s Land of the Dead TPB. Presenting a special adaptation of George A. Romero’s long-awaited zombie movie, set years in the future after the end of his Dead trilogy. 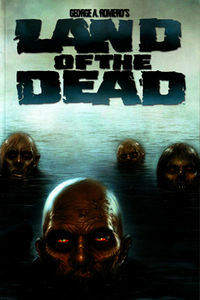 In Land of the Dead, the walking dead roam an uninhabited wasteland and the living try to lead “normal” lives behind the walls of a fortified city. But outside the city walls, an army of the dead is evolving. Inside, anarchy is on the rise. With the very survival of the city at stake, a group of hardened mercenaries is called into action to protect the living from an army of the dead. This special collection features seven new pages of story and art, comprising a deleted scene from the movie, as well as an art gallery of covers, sample art, and more. Quantities are limited, but we’re offering George A. Romero’s Land of the Dead TPB for 40% off the cover price! Yeah, that’s right. Yours for just $11.99. Hurry, this one won’t last long. Check out other horror books here.